Capital Region Water’s contractor will performing final street restoration at the seven excavation sites beginning April 17th. This street restoration will include the removal of all temporary asphalt and installation of permanent asphalt. Streets may be closed temporarily while this work takes place. Capital Region Water kicked off a $1.3 million sewer replacement project on Monday, November 14th. 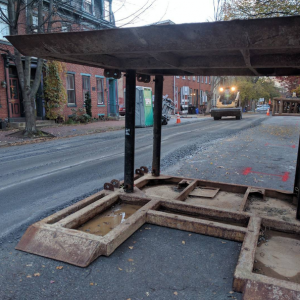 This project will resolve broken sewer mains and will ensure reliable wastewater service for several decades by replacing and renewing aging sewer infrastructure at ten locations in Harrisburg, PA. This project was initiated after structural deficiencies in the sewers were identified through video inspection of sewer pipes in 2015 and 2016. Street closures, no parking, construction noise, and temporary sewer service interruptions. Working hours will be 7:00 AM – 5:00PM, Monday through Friday. This project will not require access to customers’ homes. When the pipe replacement is complete, the road will be temporarily patched until final street restoration in the spring of 2017. Customers in the affected area will be notified door to door prior to construction with additional details. Three sewer mains on Crescent Street, Maclay Street, and Parkway Drive will be renewed with a cured-in-placed pipe (inserting a new pipe into an existing pipe) and do not require street excavation. Potential impacts from the cured in place lining include: temporary traffic disturbance, temporary sewer service interruption. Customers in the affected area will be notified door to door prior to this work with additional details. Customers with questions can contact Capital Region Water by phone at 888-510-0606 or by email at info@capitalregionwater.com. Capital Region Water will also have a representative on site during working hours.